. 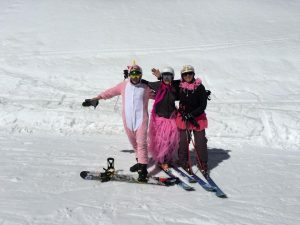 You know you’ve done your job right when you raise a son who’s comfortable dressing as a pink unicorn while he enjoys the last day of the season at Heavenly with his cousin. He’s had a hard time the last few years, and it’s great to see him enjoying himself. His 4 year old daughter will be so proud of her daddy, the Unicorn. But I digress. I’ve been working my tail off, trying to get Heartless ready for take off. I’m thinking that May 15th will be publication date, but man, there’s so much to do for indie publishing. I’m not a control freak, so it isn’t a total thrill, but it’s interesting enough for me to enjoy. I’ve got a fabulous cover, slaved over the cover copy, I’m still dealing with challenging edits, then proof reading, formatting, and … ta da! I’m still trying to figure out how to balance a second full-time job in my life (publishing as well as writing) but the freedom is enormous, and since I’m very much “the glass is half full” kind of gal I expect, as Crusie says, nothing but good times ahead. But for today I finish the revisions, run through every kind of checker I can get to pick up typos, and then pass it to my proof reader while I wait to hear from Mollie, my marketing and web guru. Fortunately I’m in love with the book, with Emma and Brandon, and they’re going to be so happy to see the light of day after maundering for three years. Oh, and if anyone out there loves a book of mine (I tentatively assume there are) go post a review somewhere, like Amazon or Good Reads. I went searching for reviews last week, always a bad idea but I needed to check feedback on a certain plot point in a certain book, and I was surprised at how few there were. Only if there’s a book you love that you feel hasn’t got enough attention. Or hell, if there’s one you hate, go ahead and trash it. I’m a firm believer in honesty. I’ll have more deets on HEARTLESS, including the cover. In the mean time, be excellent to each other and party on, dude. May 15th can’t come soon enough! Thank you, thank you, thank you. Thank you Krissie. I have missed your posts. Counting down the days until May 15th. I really needed some good news today! Thank you so much! I have waited sometimes not so patiently for the end to the Rohan family series. I am beyond excitef. I will look at Amazon to check on reviews you might need. I love your male anti hero heroes and strong not-so-beautiful, heroines. Thank you for letting Emma and Brandon live again. I can’t believe I missed this post! Life took over and I forgot to check back, then yesterday I got an email from Amazon about your pre order. When will Barnes and Noble have it? Absolutely. It’s not up yet, which surprises me, but I expect it’ll be up sometime today.